Because it was such a disaster for other companies that did slacktivism, Levi Strauss (and president Chip Bergh) has decided to stick their noses in Gun Control issue to alienate their employees, investors and customers. After 2016 and someone was injured themselves in a store while carrying, Levi's asked armed customers to not enter their stores, offices or facilities. Then in 2018, they had a blogpost announcing their decision to go Full Retard and to partner up with two fanatical liars: Michael Bloomberg, and Everytown for Gun Safety. Which is kind of redundant, since the latter is just part of the former's gun-propaganda wing. Everytown is known for using misleading numbers and dishonest facts to deceive the gullible. 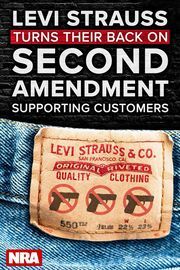 So Levi's is creating a Safer Tomorrow Fund, creating a "Everytown Business Leaders for Gun Safety" to try to extent their corporate virtue signaling virus to other companies, and to pressure their employees to matching their Safer Tomorrow donations against the Constitution. Many people think this is a reaction to declining sales from the left since they shut down most U.S. production and moved it to offshore labor. Since Levi's is not publicly traded (other than their Japanese subsidiary), they didn't get hammered on the stock market, but politically, it was not welcomed by 100 million informed Americans, who don't like gun illiterates assaulting the constitution. Many people in my circles were swearing off Levi products for good. I know I bought my last Levi item until they replace their President and/or apologize. This page was last edited on 7 February 2019, at 16:05.